Did you know that eating healthy, made from Mother Earth food, can actually put you in a better mood? Well, it is true! When we understand that food is more than just for your body, but is also fuel for our brain and has amazing physiological benefits, we can eat our way towards a happier outlook. 1. Eat more fruits and vegetables. The antioxidants you get from fruits and vegetables helps reduce inflammation in the body, which has been linked to depression. Inflammation can also cause brain fog and fatigue. Start with one piece of fruit per day and work your way up from there. With vegetables, start by trying to add vegetables to every meal. 2. Include a daily dose of dark leafy greens to your daily meal plans. They have many mood enhancing abilities because they are full of antioxidants that not only give your body a healthy boost, but your mind as well. 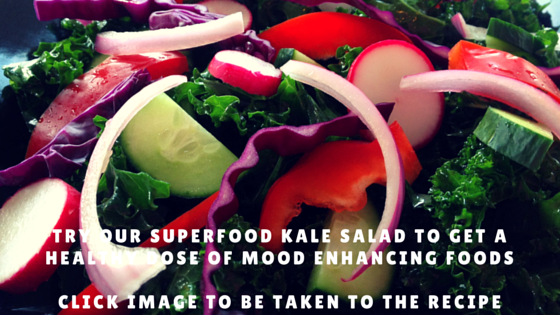 A 2013 Harvard study found that eating foods high in antioxidants like dark leafy greens will boost your mood. Wash and dry a large batch of romaine lettuce, or kale and add it to every meal. This is also a great way to get your fiber, which will help your body release daily toxins.